Bringing Silicon Valley Inside: I read the paper “Bringing Silicon Valley inside” by Gary Hamel (HBR Sept-Oct 1999) after Prof. Krishnan mentioned it in his talk last week on “Efficiency vs. Innovation” at k-community meeting. Hamel and Valikangas have presented an extension of this work in the paper “Internal Markets: Emerging governance structures for innovation”. In this article, I present my understanding of the idea presented in the paper and also a tool for assessing your “internal innovation market”. Limitations of Hierarchy: After studying Silicon Valley as if it is a giant organization with its own capital and resource allocation decisions, Hamel concludes that valley thrives on resource “attraction” rather than resource “allocation”. Traditional management hierarchy achieves “sustaining” innovation through exploratory activities aligned with and exploiting existing competencies and businesses. Hence, ideas which are not aligned with current businesses are likely to be ignored or suppressed. After all, if all ideas from Valley went to Bill Gates for approval, only those supporting Windows platform would have survived. According to Hamel, 3 markets are critical for radical innovation: (1) Market for ideas (2) Market for capital (3) Market for talent. What are markets? A market is a place where buyers and sellers find each other, players compete for best goods & resources, where individuals exercise choice. It is also a mechanism for resource allocation and it is supported by social network of brokers, buyers and sellers. 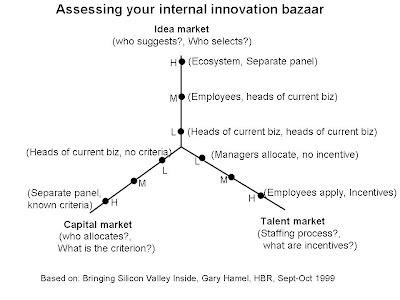 Assessing your internal innovation bazaar: Do you have a market for ideas? Well, it will depend upon who is suggesting the ideas and who is selecting them. If only senior executives from current businesses suggest ideas and they are the ones who select them, result is known before the exam. On the other hand, if you have an ecosystem of customers, suppliers and employees who suggest ideas and a panel separate from current business selects them there is a good chance that radical ideas will survive. Extending these questions for the other two markets (capital and talent) I have created following three dimensional dashboard. Can you assess efficiency of your internal innovation market? Great stuff but there is a small catch.. I suggest do a ‘systems thinking’ approach to this before embarking on this. Many assume that we have the ‘fundamentals’ in place for the innovation market . Need to ensure that the ‘hygiene elements’ are in place, employees are ‘engaged’ in the workplace etc. There are good instruments used by HR folks to assess this – please do this … as many assume or are proud of their environment. Talk to employees of the six billion dollar firms in India – you will find the company pride missing (which was there couple of years back!) and you expect them to play in the idea market? foget it!..Net net go back to basics and get the house in order. Is your business model sticky?